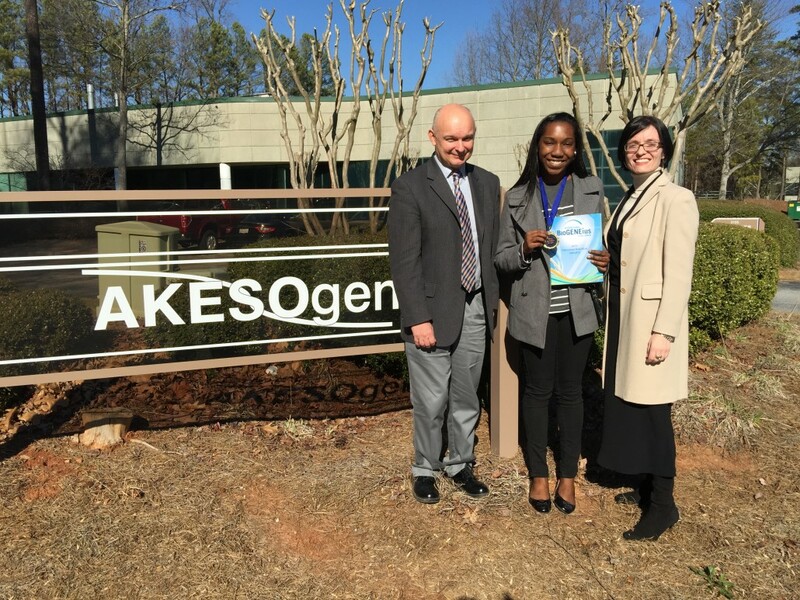 February, 11, 2015 – The 2014 Georgia BioGENEius Winner, Kayla Evans visited Georgia Bio AKESOgen. The visit began with an introduction of the company and then the small group including Ms. Evans and her parents, and Georgia BioEd Institute Program Director, Melissa Nikolic, proceeded to tour the facility. Ms. Evans learned about opportunities in the life sciences field and heard from AKESOgen employees about the research and technology at the company. The BioGENEius Challenge is the premier competition for high school students that recognizes outstanding research in biotechnology. It promotes excellence and enables students to continue research in biotechnology and design an original independent research project. Applications are now being accepted for the 2015 Challenge. Click here to learn more. AKESOgen were delighted to sponsor Ms. Evans attendance and presentation at the Georgia Bio Awards Dinner on January 22, 2015.